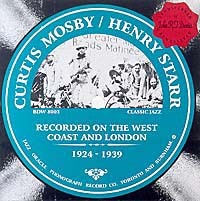 The complete output by Curtis Mosby including two previously unknown and unissued sides from 1924-25 as well as an unissued test of “Weary Blues”. Rare recordings by pianist Henry Starr made for the incredibly rare Flexo label in 1928. Six sides by Ivan Browning and Henry Starr recorded in London, England in the mid 30s including an unissued HMV test. Probably: Henry Starr (p) dir. Harry Barken (t), Lloyd Allen (tb), H.L. Brassfield (reeds), Fred Vaughan (bjo), Curtis Mosby (d). Curtis Mosby (d) dir. James Porter (t), Ashford Hardee (tb), Charles Hite-Leo Davis (cl,as), Bumps Myers (ts), Attwell Rose (vln), Henry Starr (p,v), Thomas Valentine (bjo), ____ Perkins (bb). Note: Weary Stomp and Weary Blues are alternative renditions of the same piece. The titles are as given on the original records. Curtis Mosby (d) dir. James Porter (t), Ashford Hardee (tb), Charlie Lawrence-Les Hite (cl,as), Bumps Myers (ts), ? Andy Iona (Aiona) (stg), unknown (vln), Walter Johnson (p), Fred Vaughan (bjo), unknown (bb). Country Allen (tb) replaces Hardee. Unknown (v) added. Ivan Harold Browning (v), Henry Starr (p,v), George Elliott (g), unknown (sb), Harry Francis (d).